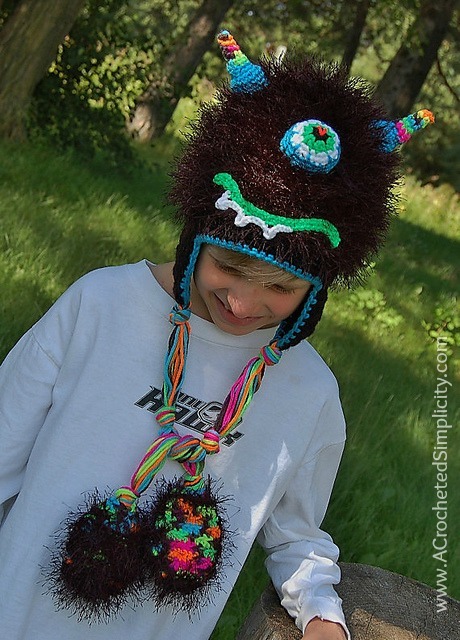 Do you have little ones who like to pretend they’re furry monsters? If so, they’ll love the Monster Mash Beanie or Earflap. They’ll have fun helping you customize their monster’s face. 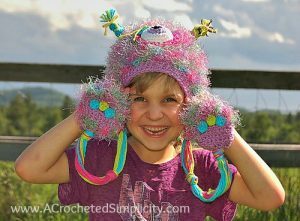 *Purchase an ad-free PDF of this pattern (including all photo tutorials) on Craftsy or Ravelry* Ad-Free version includes BOTH the Boy and Girl Monster versions (all sizes) in ONE file! Yarn: Medium Worsted Weight Yarn / 4; Fun Fur Yarn *See Notes below for exact yarns used. 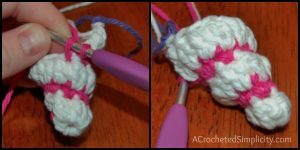 Half-Double Crochet Decrease (hdc2tog): [Yarn over, insert hook in next stitch, yarn over and pull up loop] 2 times, yarn over and draw through all loops on hook. 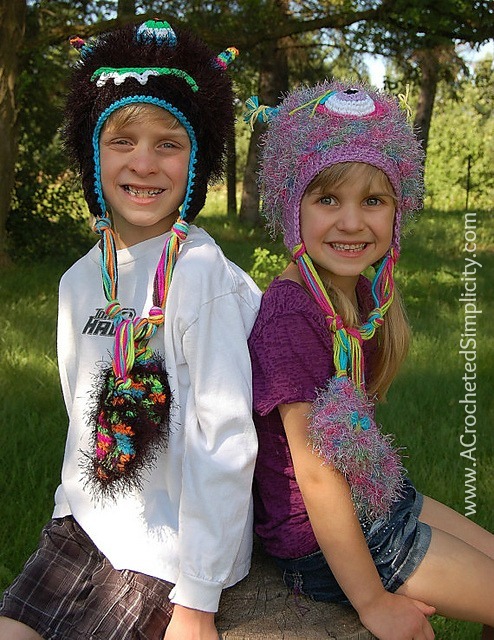 Medium worsted weight yarn was used for the base of the hat, earflaps, paws, braids, and facial features. Approximately 250 yards for the largest size. Fun Fur: This yarn was used on the main part of the hat and the paws. You will need 2 balls. Note: The use of stitch markers is highly recommended as the hat is worked in a continuous spiral. You will be making the hat (working w/ 1 strand of WW yarn) and then adding the fun fur after that using 1 strand of fun fur. **Working in Both Loops for Rnds 13 – 14. Fasten Off. Invisible Join Technique (click HERE for tutorial). Weave in ends. Continue on to Adding Fur to your Monster. Yarn: 1 strand of Fun Fur Join Fun Fur w/ a sc (click HERE for tutorial), in the Front Loops Only of the 1st hdc of Round 1, sc in the Front Loops Only of each st around the spiral to the beginning of Round 13. Note: To make a Beanie instead of an Earflap hat, work one final round of sc instead of earflaps. Fasten off using Invisible Join Technique (click HERE for tutorial). Weave in ends. Join yarn w/ a sc in the center back st of your hat, sc in each st around the earflaps and hat. Join w/ as sl st to the 1st sc of the round. TIP: work 2 sc in each 2 sts at the bottom of earflaps for a more rounded look. Fasten off using Invisible Join Technique. Weave in ends. Continue below to work the Braids and Furry Paws. **Work in Both Loops for Rounds 14 – 16. Yarn: 1 strand of Fun Fur Join Fun Fur w/ a sc (click HERE for tutorial), in the Front Loops Only of the 1st hdc of Round 1, sc in the Front Loops Only of each st around the spiral to the beginning of Round 14. Fasten off using Invisible Join Technique. Weave in ends. **Work in Both Loops for Rounds 16 – 18. Yarn: 1 strand of Fun Fur Join Fun Fur w/ a sc (click HERE for tutorial), in the Front Loops Only of the 1st hdc of Round 1, sc in the Front Loops Only of each st around the spiral to the beginning of Round 16. **Work in Both Loops for Rounds 17 – 19. Fasten off using. Invisible Join Technique (click HERE for tutorial). Weave in ends. Yarn: 1 strand of Fun Fur Join Fun Fur w/ a sc (click HERE for tutorial), in the Front Loops Only of the 1st hdc of Round 1, sc in the Front Loops Only of each st around the spiral to the beginning of Round 17. **Work in Both Loops for Rounds 19 – 21. Yarn: 1 strand of Fun Fur Join Fun Fur w/ a sc (click HERE for tutorial), in the Front Loops Only of the 1st hdc of Round 1, sc in the Front Loops Only of each st around the spiral to the beginning of Round 19. **Work in Both Loops for Rounds 20 – 22. Yarn: 1 strand of Fun Fur Join Fun Fur w/ a sc (click HERE for tutorial), in the Front Loops Only of the 1st hdc of Round 1, sc in the Front Loops Only of each st around the spiral to the beginning of Round 20. **Work in Both Loops for Rounds 21 – 24. Photo Above Left: Shows what your hat will look like before adding fur. Note the ridges from working in the back loops. Photo Above, 2nd from Left: Shows joining your fun fur w/ a sc to the 1st hdc of Round 1. Photo Above, 2nd from Right: Shows fun fur being worked around the spiral. Photo Above, far Right: Shows what your hat will look like after adding the fun fur. After you’ve finished adding the fur yarn, fasten off and weave in ends. If needed, use a wire brush to fluff the fur yarn. For the knotty braids pictured on the purple monster hat, I used 4 strands of 3 different colors per braid. I cut my strands of yarn at 36″ to give myself enough length to tie the knots. Obviously, 36″ is going to be overkill for a newborn hat so adjust your lengths of yarn accordingly. Weave your yarn thru 2 stitches along the bottom edge of your earflap. Even out the lengths so that they’re folded in half thru the earflap. 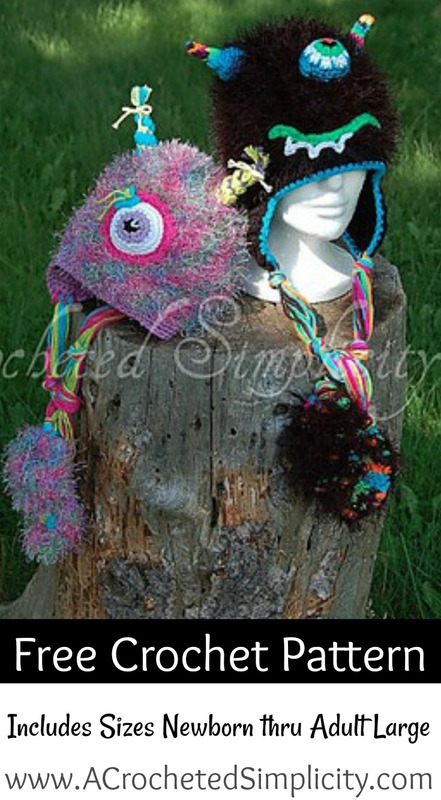 Secure the strands by knotting them close to the earflap. Then continue to knot in as many sections as you’d like. I added 2 additional knots to mine, the last one near the bottom of the strands (this is so that I have a knot to sew my Furry Paws onto later on). Trim ends to 1-1/2″ below your bottom knot. Fasten off leaving a tail long enough to sew onto braid. Continue below to Paw Pads. With 1 strand of WW yarn, begin w/ a Magic Ring, work 4 sc in in Magic Ring. Pull to tighten. 4 sts Fasten off leaving a tail to sew onto the paw. Sew 3 onto the paw as shown. Continue on to Adding Fur to your Paws. You’re going to add fun fur to your paws in the same way as you added it to your hat except you won’t be covering the front of the paws with fun fur. Round 1: Join yarn w/ a sc in the Front Loop of the 1st hdc of the paw, working in a continuous spiral and Working in Front Loops Only, sc in the next 44 sts. See photos A & B above. Row 2: See Photo C Above, work sc in the Front Loops of a st in the round just below, Turn to work across the back side of the Paw, sc in the next 16 sts. See Photo D below. Row 5: Repeat Row 2 and then sc in each st around the front of the Paw. See Photo E above. Fasten Off. Weave in ends. Fluff the fun fur. Photo F shows what your work would look like (the back side) after Round 5 is complete. Fasten Off. Weave in ends. Continue below to add paw prints and attach the paw to the braid. Photo above, left: shows the Front of the Paw after you’ve fluffed the Fun Fur. Photo above, middle: attach the Paw Pads to the inner side of your paw using the yarn tail and a yarn needle. Only sew thru one layer of the paw. Photo above, right: using a yarn needle and the tail of yarn left on the paw, sew the paw to the knotty braid. 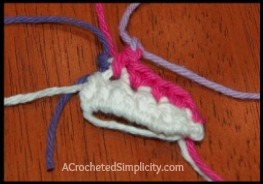 Insert the ends of the yarn on the braid into the paw then sew the paw around the braid. Make sure you complete at least 3 stitches “thru” the bottom of the knot so that it secures your paw to the braid. Continue on to Boy or Girl Monster Features. Note: The horns are worked in a continuous spiral round starting from the tips. Do not join rounds. The use of stitch markers is highly recommended for these pieces. Round 1: Beginning with MC and a Magic Ring, sl st in Magic Ring, ch 2, work 3 Clusters in Magic Ring. 3 Clusters *Drop MC from your hook and place it on a stitch marker. Round 2: Join AC w/ a sl st to the 2nd ch of the ch 2 at the beginning of Round 1, 2 sc in “next” st (not the same st as ch 2), sc in next 2 sts. 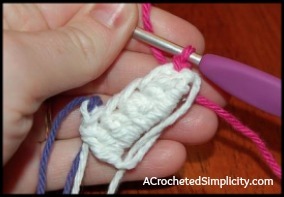 4 sts *Drop AC from your hook and place it on a stitch marker. Place loop of MC back on your hook. You will continue to switch colors in this fashion. This is why stitch markers are so important. You do not need a fancy stitch marker. I use a scrap piece of yarn. 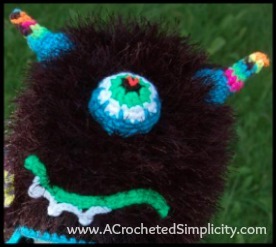 Note: Photos showing White & Pink yarn are not photos of the Monster Horn so do not count stitches in the photos. However, they do show the proper technique needed to complete Millie’s Horns. Pull Magic Ring to tighten. Be sure to work the beginning of Round 3 tight to keep from having a gap. Round 6: With AC, sc in next st, sc in next 5 sts. 6 sts *Fasten Off AC. Leaves a small opening to stuff the horns. Fasten off leaving a tail of yarn to sew horns onto hat. Stuff horns with scrap pieces of yarn, if desired. Continue on to Horn Tassels. Cut 18 pieces of yarn 6″ each. Each Tassel uses 6 pieces. 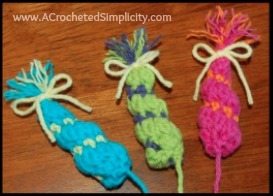 Using a crochet hook or a yarn needle, thread 6 pieces of yarn through a space near the top of a horn. 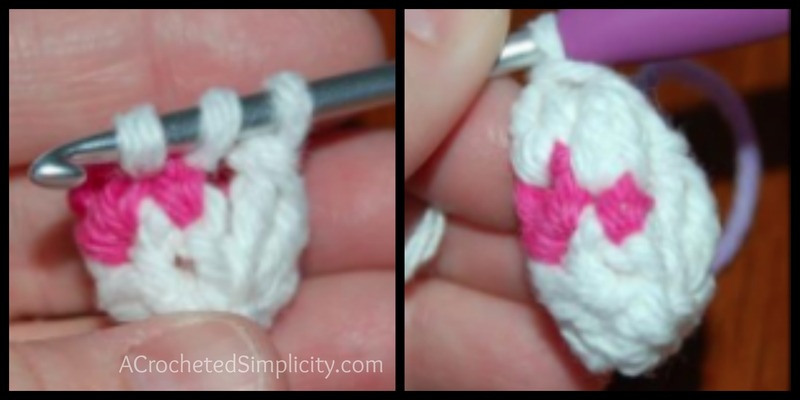 Secure the pieces of yarn with a knot. Trim ends to desired length. 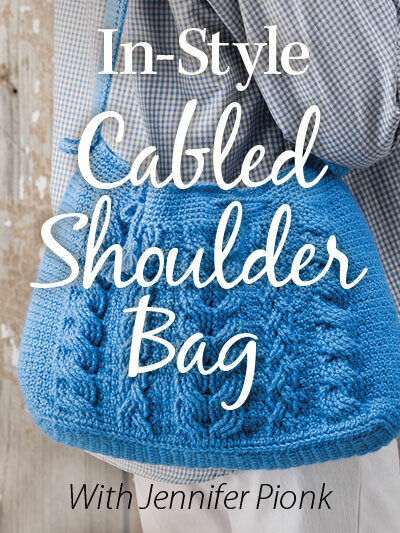 Pull yarn apart to give it a fuzzy appearance, if desired. 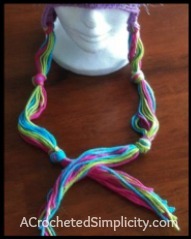 If desired, tie a single strand of yarn around the tassel and tie in a bow. Continue on to Eye. Note: For sizes Newborn thru 12 months, you may want to go down a hook size when working the “Eye”. Round 8: Using Pink, ***Working in Back Loops Only***, *ch 2, dc in the same st as ch 2, skip next st, sl st in next st, rep from * around. Join w/ a sl st to the 1st ch of beginning ch 2. Fasten off leaving tail of yarn to sew your eye onto the hat later. Use Invisible Join Technique. 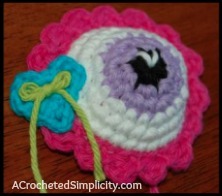 Using a yarn needle and white yarn, stitch a little “V” into the black portion of the eye. See photo below. Continue on to Heart. Using Blue Yarn and a Magic Ring, (work all of the following stitches into the Magic Ring): sl st in Magic Ring, ch 2, dc, trc, 3 hdc, ch 3, 3 hdc, trc, dc, ch 3, sl st. Pull to tighten. Fasten Off. Use Invisible Join Technique. Leave a tail to sew onto Eye. Layout your Eye and Horns onto hood. 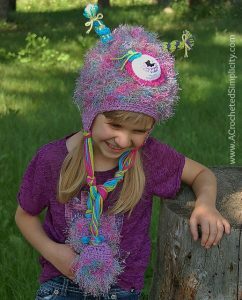 Using a yarn needle and yarn tail, sew each piece onto your hat. Weave in ends. Using a contrasting yarn, add a little bow if desired. Round 6: Ch 1, sc in the same st as ch 1, sc in each st around. Join w/ a sl st to the 1st sc of the round. 24 sts Fasten Off. Use Invisible Join Technique. Fasten Off. Use Invisible Join Technique. Leave a long tail to sew onto hat. Using a yarn needle and a contrasting piece of yarn, make a little “V” on the pupil of the eye. 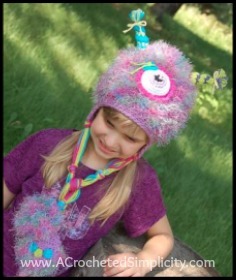 Sew eye onto hat using a yarn needle and the yarn tails. Ch 30, sc in 2nd ch from hook, sc in each remaining ch. Fasten Off. Leave long tail to sew onto hat. Decide where you’d like your teeth to be positioned on your mouth and join yarn w/ a sl st to an “Front Loop” of the mouth. The following is worked in “Front Loops Only” ( ch 4, sl st in 3rd ch from hook, ch 1, skip next st, sl st in next st, sl st in next 2 sts ) 3 times. Fasten off. Leave tail to help secure teeth to hood so they’ll lay flat. Sew mouth onto hat using a yarn needle and yarn tail. Bend mouth as you go to create the wavy line. Fasten Off. Use Invisible Join Technique. Leave a long tail to sew onto hat. **Use scraps of yarn to stuff horns, if desired. Sew horns onto hat using a yarn needle and the yarn tails.